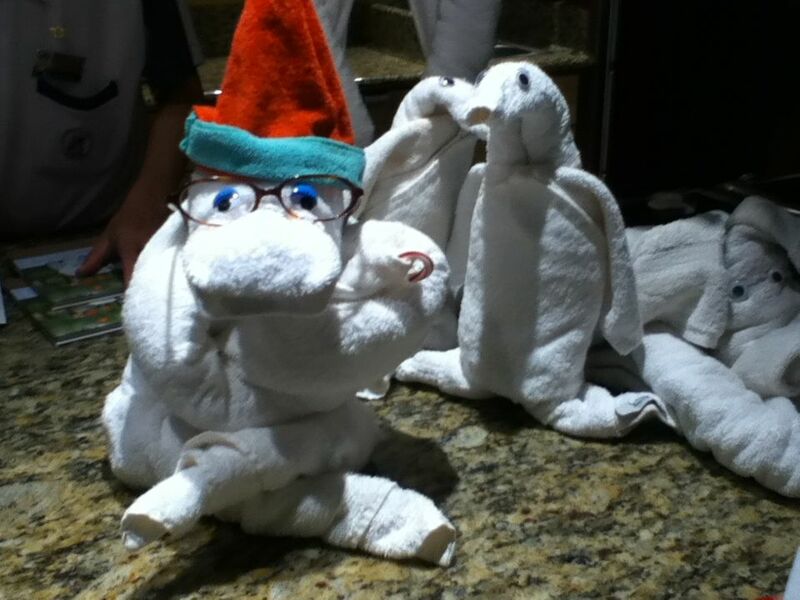 Over Winter Break, Katrina and I took a cruise with her parents to the eastern Caribbean islands. Out destinations included Nassau (in the Bahamas), Porto Rico, St. Barts (a French island, known to the French as Saint Barthélemy), Dominica, Antigua, St. Thomas (in the U.S. Virgin Islands), Half Moon Cay (Holland America’s privately-owned island in the Bahamas), and the Florida Everglades (back in good ol’ USA). All in all, the 10-day cruise covered about 2,500 miles, but the distances between the islands were pretty small, only a couple hundred miles (and often with many an island in-between our destinations). It was all the more intriguing, therefore, to see just how different those islands could be, both geographically and culturally. Our cruise started and ended in Ft. Lauderdale, Florida – but my impressions from the trip started a little earlier, on our first flight out of Indianapolis. As we approached Atlanta, the darkness gave way to a dazzling orange streak of light, which gave way to a calmer pink hue that spread over the sea of clouds below us. I have seen clouds from airplanes before, of course, but here the likeness to the early-morning sea – with foaming pink wave crests, and sprays of mist below – was breathtaking. And so, even before I had stepped onto the cruise ship, I experienced the joy of being at sea. The second flight, from Atlanta to Ft. Lauderdale, also became notable as we approached our destination. The city dazzled us with its abundance of water – first with wetlands and marshes on the outskirts of the city, then with Amsterdam-like canals running alongside streets and highways, then with ponds and fountains surrounding nearly every suburban home. Again, even before I had stepped onto the cruise ship, I was surrounded with water! Our ship – when we got to it – was Ms. Maasdam, operated by Holland America. Compared to other cruise ships, it was on the medium-small side (700 ft long, 100 ft wide), with about 1200 passengers onboard (served, by the way, by 550+ crew members – essentially one crew member per couple!). 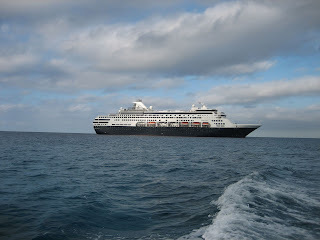 When in port, alongside other larger and newer ships, the Maasdam seemed to lack a little bit in grandeur, but we were quite content with it: its veranda offered good views of the sunset, the dining room and show room were magnificent, and our room –windowless, but with a curtain over one end of the bed, to give a very convincing illusion of a window – was quite comfortable. Add to that some wonderful meals and entertainment aboard the ship, and some new and exciting destinations while on shore, and there was little else we could wish for. Dec. 24th, 2011: Christmas Eve. Nassau, Bahamas. Dolphin swim. Our first island was New Providence (best known for its city of Nassau, which is the capital and commercial center of the Bahamas). We had arranged our own (non-through Holland-America) excursion that day – a Dolphin Swim on the privately-owned island of Blue Lagoon. After a short taxi ride to the ferry terminal, a 20-minute boat ride took us to the island. As the shoreline of Nassau stretched alongside us, we passed some dazzlingly expensive-looking beach-front homes and yachts, which contrasted sharply with shirtless black fishermen we saw along the way. But, on entering Blue Lagoon island, all other thoughts washed out of my mind. We were in Dolphin land! After donning on a wetsuit and a lifejacket, we jumped into the rather chilly water, and two dolphins – two dolphins for a group of six of us: Kat and I, her parents, and another couple – came up to greet us. The trainers were sitting at the water’s edge, motioning to the dolphins exactly what to do (and tossing in an occasional fish, to sweeten the deal), so the interaction was not particularly spontaneous. But, spontaneous or not, this was the first time I’d ever petted a dolphin, or hugged one, or danced with one (hanging on to the pectoral fins on the dolphin’s side, while the dolphin jiggled back side to side), or got squirted with salt water by one (this happened while Katrina’s dolphin was giving her a kiss on the lips, as a way to distract the jealous husband… very funny, I’m sure it was the dolphin who thought of that, to the complete surprise of the trainers!) Katrina’s dolphin also gave her a Christmas present: a tiny pebble, hardly the size of a cherry. According to the trainers, it’s the smallest present they’d ever seen the dolphins bring up (the other person in our group received a hefty rock the size of an orange). On the other hand, that guy looked at the rock and tossed it back in the water (this lack of gratitude earned him some blow-hole squirting as well, as a token of the dolphin’s displeasure), whereas Katrina’s rock was small enough that she kept it all throughout our trip. Then came the dolphins’ final behavior, the Incredible Foot Push. And incredible it was. Lying on my stomach, feet a little apart, I had two dolphins swim up to me, put their noses in the arch of my foot, and accelerate to 25 miles per hour, lifting me clear out of the water with my arms at my side. It was pretty incredible how strong – and also how coordinated – they were. The trainers said that this behavior takes six months to a year to teach, with a special emphasis on safety: dolphins need to learn to let go if person bends their legs (a sign to stop), to aim at a particular target (a white flag on the other side of the pool), and to avoid ramming the person into the other end of the pool (also good). But the resulting behavior really was, just as advertised it, pretty incredible (I also can’t imagine the trainers complaining too much)! I was the first person in the group to do it, after which the dolphins took a little rest (for them this is the equivalent of a hard sprint), and then proceeded to launch each of the others into the air, superman-style. All-in-all, the actual interaction time was short (and I wish we could have had time to just swim in the water, while the dolphins did their own thing), but I’m very glad we got to do it. At the end of our dolphin interaction, we still had another hour left before the Blue Lagoon’s shuttle boat would take us back, so we set off to explore the little island’s shoreline. As it later turned out, we had ventured into the “no swim” shore, which explains why it looked so pristine. There we frolicked on the rocks, and swam after fish, and looked into the big wide ocean, which looked so inviting and untouched from our vantage point. It was only for fear of missing the shuttle boat, and consequently the cruise ship and the rest of the cruise, that we forced ourselves to go back to the dock and – after a half hour of waiting, for the ferry seemed to operate on loose Bahamian time – ride back to the bigger and far more crowded Nassau. Later that evening, a few volunteer choirs staged a performance of Christmas carols. Most memorable was the Filipino choir (essentially, composed of members of the kitchen and housekeeping staff), who sang beautifully in their own native tongue. Amidst their own people, in festive costumes, and on stage, they proudly shared their cultural heritage with us, and it felt good and proper to have them be the stars of the show, rather than the usual smiling but somewhat class-separated servicemen of the ship. There was also a very spirited performance of “This Christmas” by the ship’s African-American DJ, with much clapping, tapping, “c’mon ya’ll”-s, and a very good voice. The cruise organized various events for the day at sea (and for other days too, though most of that time we were on shore, exploring the islands). This time, however, we attended an amazing towel-folding demonstration: a form of origami, if you will, but with unique constraints and possibilities owing to the coarse, thick, and bendable nature of the material. 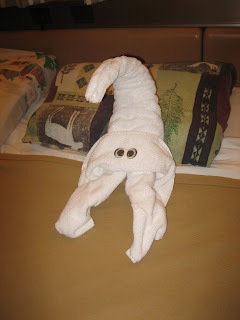 I should preface by saying that every night of the cruise, house-cleaning would leave us a fun towel creation on the bed, be it a lobster, elephant, or monkey. 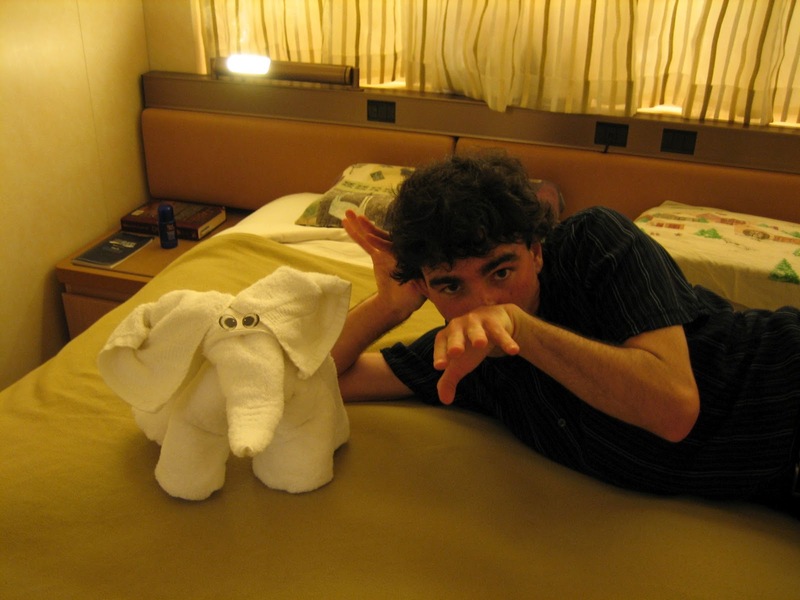 The first couple of nights, they started out simple (what our Indonesian instructor called the “10-second animal”); after the demo, perhaps by popular demand, we got the more exotic animals (e.g., the said elephant; a “1-minute animal”). 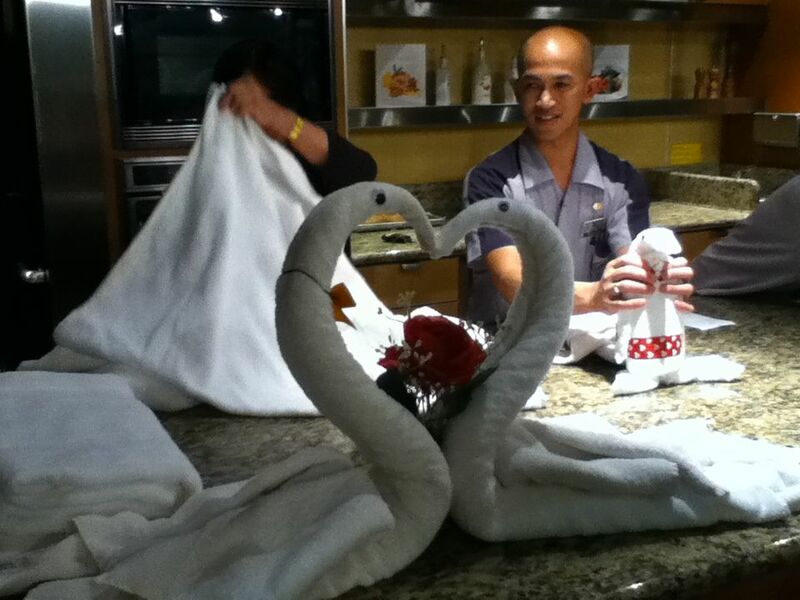 There was, of course, always room for improvement: during the demo, he showed us a swan creation that Holland will do for guest celebrating their 25th or 50th anniversary, complete with a lovely flower bouquet and a bow tie attached to the male swan (and an imaginary wine bottle and two glasses at the swan’s side). 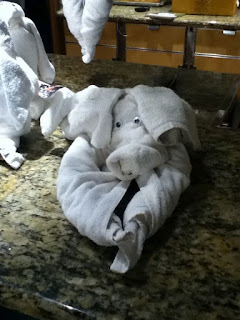 This, he said was the “5-minute animal”, a true pinnacle of towel-folding ingenuity. 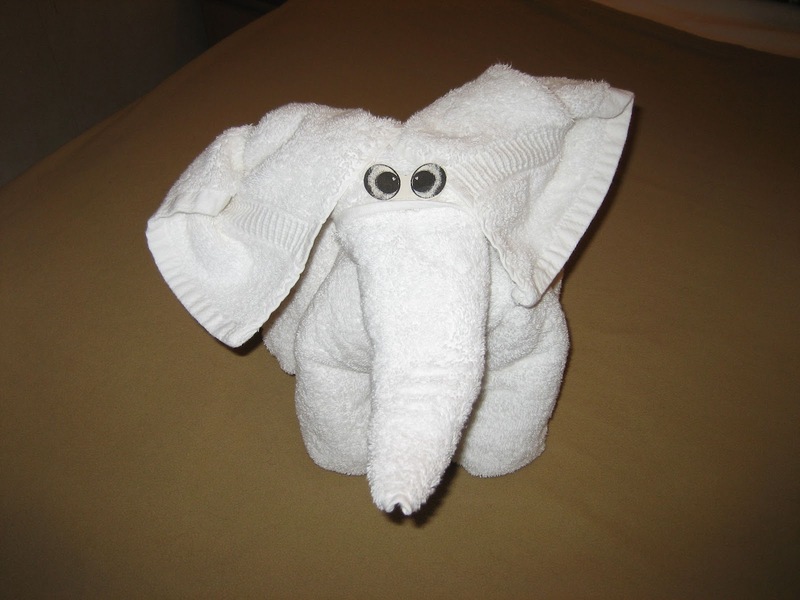 But the most important part, for any towel-creation animal, was the googly eyes – it gives the viewer an immediate sense of personality to the animal (and, for that matter, an immediate grasp of where’s the head!) Other accessories, such as eye glasses for an old grandma-monkey, or real peacock feathers for a peacock, obviously help too (if no peacock feathers are to be found, our instructor assured us, the peacock can easily be dubbed a turkey). But the googly eyes – those are essential. “What would you bet I can make a 1-second animal?”, our instructor dared us? “With googly eyes, no problem. 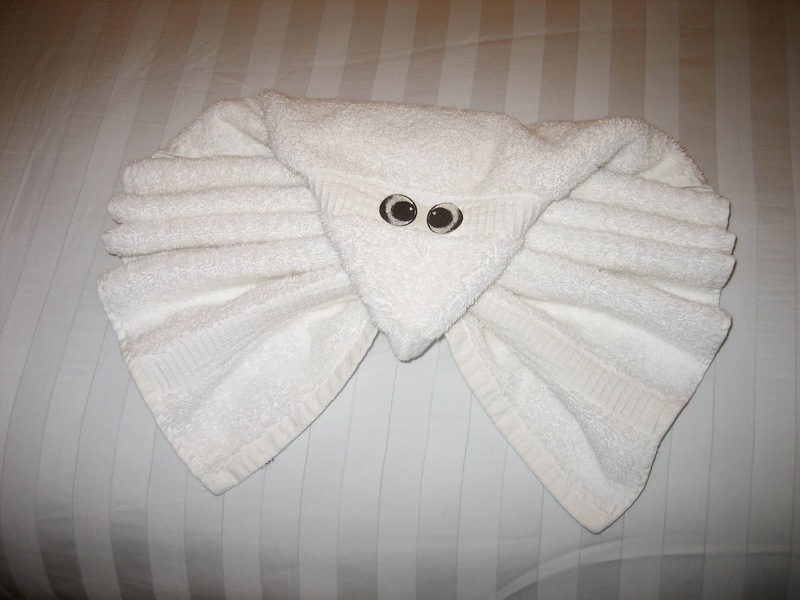 Start your stop watch.” He slammed two googly eyes onto a hand towel, scrunched it up, and held its center an inch from the tabletop, waving the towel gently up and down. There, in front of us, was a pretty convincing jellyfish! You had to be there to appreciate just how awesome the demo was, and how charming was our smiley, slightly-self-mocking Indonesian instructor, with a dismissive “oh, it’s really easy”, and fun terminology for the interim towel-folding stages like (“big carrot”, “small carrot”, and “roast turkey”). Other notable towel-creations, in addition to the above, included a droopy-eared doggy (a perfect likeness to Hazel) and a penguin. The penguin actually was pretty easy to make – so simple that our instructor called for a couple of volunteers to come up and repeat after him, and I did. My penguin ended up being a little on the floppy side (I didn’t roll my “carrots” tight enough), so he had a hard time standing; but, once he fell down, he made for a good sprawled-out sea turtle! The trick, by the way, for at-home towel folding is that the towels have to be stiff: it can’t be new, and it has to have been washed without any fabric softener (our instructor winced at the mere mention of this product). And, of course, a detailed Holland America instruction book – for sale at only $14.99 – doesn’t hurt, either! (We immediately bought it). After dinner (with, once again, incredible food, and even smoked salmon! ), the Showroom at Sea featured a really funny musical/sitcom, “Goode Company”. I had assumed that this is a well-known play, but, now that I’m writing the blog post, I can find absolutely no information on the internet about it. Perhaps the cast wrote it themselves – if so, even more power to them! The show was about four guys who now work as marketing consultants for a shoe company, but who keep reminiscing over their experience as a rock band together. Each guy has a favorite decade – the 60s, 70s, 80s, and 90s – when the music and their lifestyle felt “right”, and the show kept flashing back to the music, consumes, backdrops, and hairstyles of each of the decades. It was really fun (and featured some songs that even I knew, like “I will survive” and “Footloose”), and the actors really impressed me with the different personas (and decades) they could seamlessly transform into. We must really have been enjoying the music and the person-transformations, because, immediately after the show, Kat and I and her parents headed down to a piano lounge, where Berry from Boston was hosting a highly-addictive and interactive “Name-That-Toon” game. Berry was incredible, from his piano skills, to his engaging role as host, to his actual singing (though he may have been using a voice synthesizer to twiddle his voice to the appropriate pitch and likeness of the famous singers he was imitating; at least, he twiddled something on a box by his microphone between each song). The game was so entertaining, that I stayed for its full hour-long length, despite recognizing exactly 1 out of 25 songs (Kat’s parents recognized and named 15 of them). And then, on a whim – quite characteristic to the way we had spent the whole day – Kat and I played an hour-long game of chess on a Microsoft Surface table. “And there was evening, and there was morning – the day at sea”.